The rain hadn’t started yet Saturday morning so I pulled myself together and went to an estate sale nearby. I got there at 8:45 for a 9:00 opening and I was first in line. First! That’s never happened to me before. Ever. Frankly I was surprised as it was the second day of the sale and a Saturday so I expected a small crowd. But no crowd…just me! So I stood alone by the front door waiting for them to open mindlessly reading emails on my phone. About five minutes into my wait I was joined by a middle-aged woman. 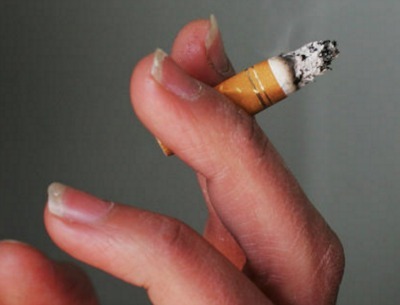 She was a heavy smoker (the smell off her clothes wafted towards me), missing some teeth and turned out to be breathtakingly chatty. I soon learned she had been at the sale yesterday, but didn’t have any cash, so they set aside the items for her. She borrowed the cash from her mom (with whom she lives) and was here to pick up her stuff and shop some more. Oh and she has epilepsy so that’s why she doesn’t carry money. And her husband died in July, killed by the insurance company that stopped paying for the oxygen he needed. She and her husband had been friends since middle school, but didn’t marry till 2008. She proudly showed me the vintage wedding ring that he had picked out for her. As a married couple they were together 24/7 and never fought. Prior to this marriage, she had a daughter out of wedlock. The father of the baby disappeared straightaway. She lives across from one of the big parks in town and sometimes brings food and bits to the homeless folks who sleep there. On and on it went. Now usually I enjoy making these type of connections with strangers, but this one wore me out. For one, it wasn’t a connection. It wasn’t a two-way conversation, but an “unburdening.” It all just came spilling out of her with me saying a lot of “oh really” and “you don’t say” type of comments. Inside, the estate sale house was pretty shabby with a layout of small, awkward rooms. It was hard getting in and out of rooms. And most of the things weren’t priced so even though it was 25% off everything (except jewelry), you never knew 25% off what?? I was tempted by a pair of used leather boxing gloves at $30, but even with 25% off (22.50) and knowing nothing about boxing gloves, it seemed too risky. Now if they had been $5, I would have bought them, no question. I likewise turned down a Vermont Company teddy bear that had seen better days. In the end I bought just a few things. 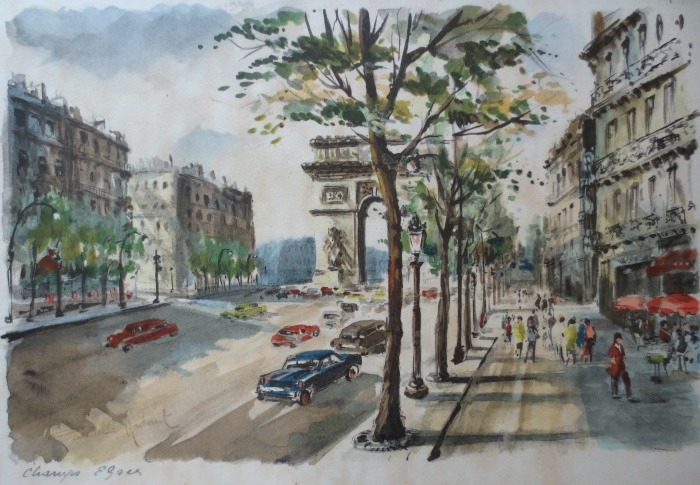 My favorite purchase was a 1950s Paris watercolor painting by Gabrielle Ardant. I love these mid-century cityscapes. (I’m keeping my eyes peeled for ones of San Francisco and New York City.) 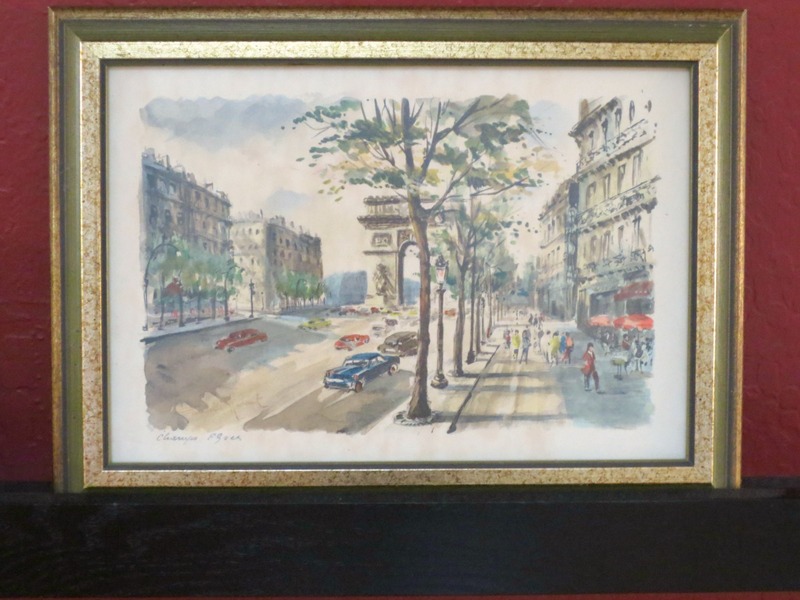 There is some slight discoloration to the paper, but the painting itself remains vivid and it is professionally framed. 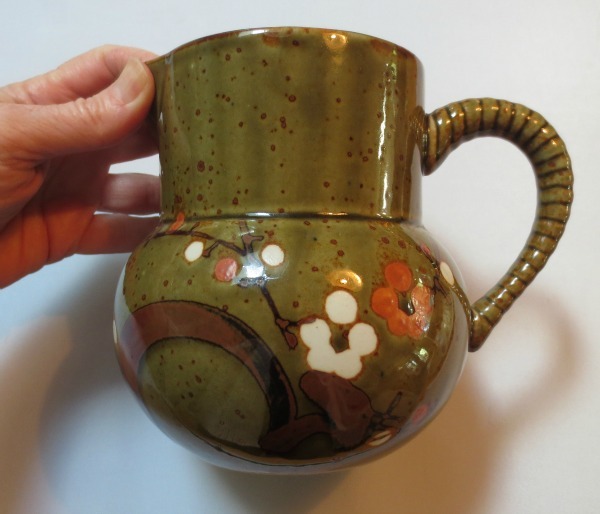 I also bought a ceramic milk jug with hand-painted blossoms. Alas there was no maker’s mark but the poor, dusty thing seemed to beg me to buy it, so I did. It’s in ‘60s/’70s colors of avocado, brown and orange, which I am sure are poised to make a comeback!!! And I decided to buy a vintage-style Giorgio Armani blazer. It’s not one of the super duper, high-end Armani’s, but it was cute, clean, undamaged and made in Italy. So, there you go. My one dud, a huge 1931 “Leaves of Grass” Walt Whitman book. It turned out to have too many condition issues and I shouldn’t have bought it. Rats! As a treat afterwards, I drove down the street to Philz Coffee. It’s a small, pour-over coffee place that always has a line out the door. (It’s that good.) When my daughter who works there saw me at the front of the line she did a little dance and sang, “Mom in the house. Mom in the house.” I’m sure I blushed as folks turned to look at me, but it was nice having my 23-year-old daughter make a fuss over me and my coffee is always comped! All in all, I’m glad I went out. And later at home, when the sun was out between spurts of rain, I sat outside on our front stoop (in a falling apart wicker chair I found by the side of the road) and felt blessed. Life isn’t easy or fair, but sometimes if we open ourselves up to it, a little happiness seeps in. What a lovely story. Really enjoyed that.